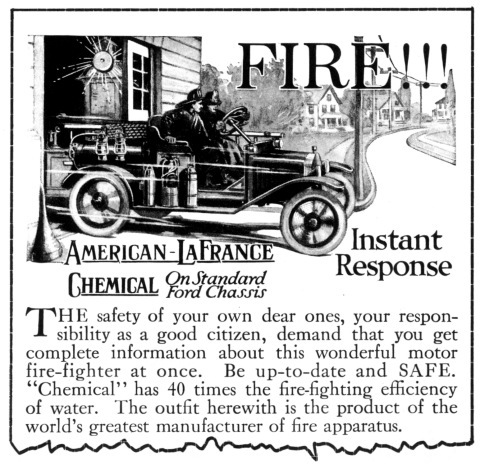 Ferndale’s first motorized vehicle was this 1917 American LaFrance Double Tank Chemical Car. Built on a Model T truck chassis, it had two chemical tanks mounted on the back. According to the original contract on file at the Ferndale Museum, it was purchased as a used demonstrator model, on February 13 of 1917. 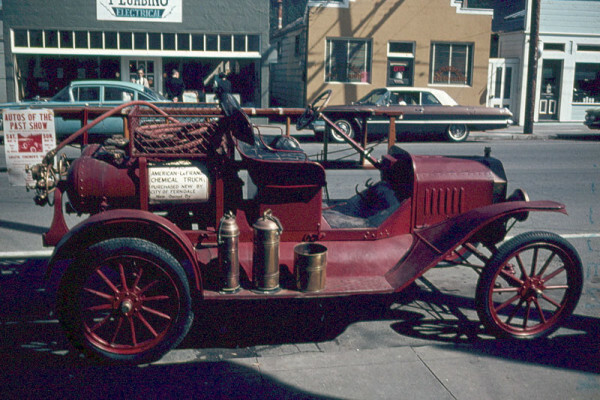 The cost was $1150, which was more than twice the price of a standard Model T at that time. It was operated by a new company, Chemical Co. 1. Since there wasn’t room for it in the newly built hall, the truck was stored in an enclosed shed at 554 Main Street (currently Sweetness & Light). In 1939 it was retired and sold to Tony Gosselin of Eureka, and the Chemical Co. 1 was disbanded.